* Cheminformatics, with a pure SWT-based chemical 2D editor (JChemPaint) and a lazy-loading molecules table. 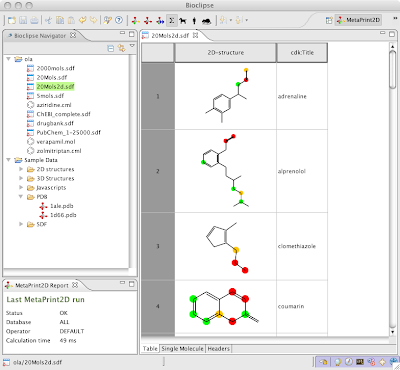 A screenshot from Bioclipse with the MetaPrint2D feature showing predicted sites of metabolsim for a set of drugs in the MoleculesTable. Note that Bioclipse 2.2.0 requires a fresh download, i.e. it can not be upgraded to by using the software update functionality. A small installation guide is also provided, but the main documentation for Bioclipse is available from help.bioclipse.net; the same information is also available from within Bioclipse from the menu Help > Help Contents. For general questions there is the bioclipse-users and bioclipse.devel mailing lists.